In Europe, mobile phones are already a regular means of payment, as fixed as buying in physical stores; 80% of Europeans use their mobile phones for payment, and 41% use them even more frequently or even daily. These are the results of a pan-European survey involving over 18,000 respondents. The research was organized by Mastercard and was conducted by Innofact’s market research company. 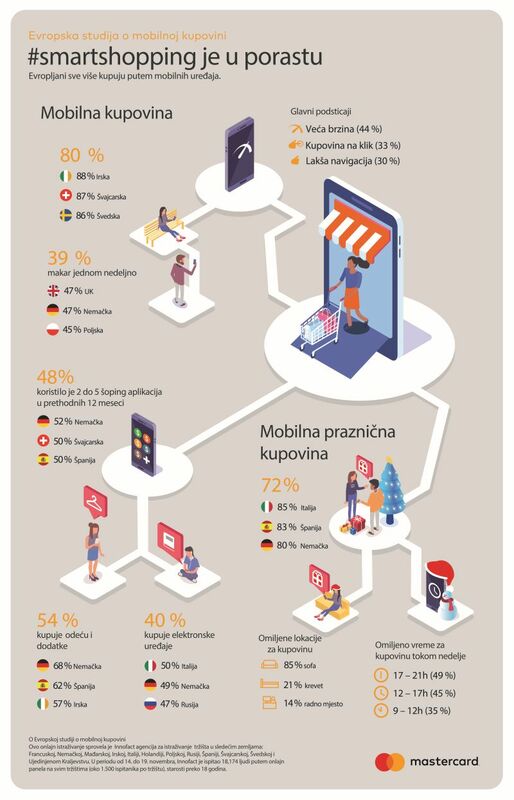 A significant number of frequent users of mobile shopping in Europe: for example, in the UK and Germany, almost half of the respondents buy mobile phones once a week or more often (47%), while in Europe this percentage is 39%. Generally speaking, mobile purchases account for a quarter of total trade (24%), according to figures obtained from 18,000 respondents. Nearly three quarters (72%) of respondents plan to use their mobile phones during holiday shopping. Most likes to buy gifts from home with sofa (82%) or from bed (25%). However, people also take advantage of mobile payments such as speed and ease of use and use breaks during the day to make fast Christmas shopping: a significant number of gifts are purchased while the user is waiting for public transport (19%), while at work (18%) , or during lunch break (9%). When respondents chose their three most favorite holiday shopping dates, the majority of Europeans listed work days rather than weekends. The most popular time (49%) is during the working day (17-21h). However, a large number of Christmas gifts are purchased on weekdays from 12-17h (42%) and from 9-12h (31%). Speed ​​and simplicity are crucial for mobile shopping. Europeans point out the various reasons why they like to buy phones: most commonly these are speeds (44%), one-click purchase (33%), simpler navigation (30%) and greater security (14%). Respondents in the UK (22%), Ireland (21%), Spain and France (20%) consider higher security as the key reason for buying phones, while respondents in Poland (63%), Germany (59%) and Switzerland (56%) They value the speed most. More than half of Europeans (54%) have already bought clothing via mobile devices, and in Germany this figure is as high as 68%. Electronic devices are in second place with 40%. For some items such as public transport tickets, there are major differences between markets: almost half of Swiss people buy tickets for public transport by telephone (48%), while this figure in Russia is only 17%. As far as parking is concerned, 44% of Swedes are paying it by mobile phone, while this number in Germany is only 12%. Considering the scope and variety of mobile shopping options, it should not be surprising that 75% of Europeans used mobile app purchases over the past 12 months. Most of them (64%) use two to five applications, and 20% even six or more.